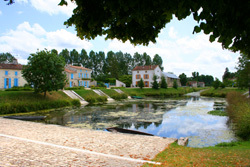 The Port de Courdault is simply one of the prettiest little places on the Marais Poitevin. 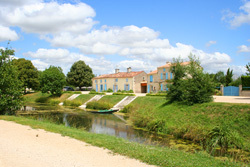 A long straight canal ends at the port, which is a rectangular sink where the barges used to turn and unload. As the sink has now fallen into disuse the surrounding warehouses have been turned into dwellings and this sleepy backwater has taken on a peaceful charm that is without doubt beguiling. 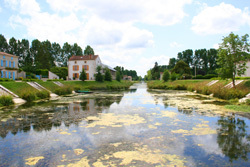 Unfortunately the Auberge Le Trou Vendéen does not profit from a frontage onto the sink, this would truly make the Auberge the visual rival of anything that I have seen in the Marais Poitevin. Inside the setting is good the first dining area which also contains the bar has plain white plastered walls, whereas on passing through a broad arch into the main dining area one is greeted by natural stone walls. The walls throughout are festooned with old implements and pictures, and the whole of the Auberge has a traditional Vendéen wooden beamed ceiling. All in all the décor is delightful and the atmosphere it creates when packed with diners is simply irresistible. As you well know ambience is a transient thing that ebbs and flows with many things including the numbers of people that occupy a space. This space seems to be well occupied on a regular basis. We had tried to lunch here before without making a reservation, and like some other notable figures in history, had found that there was “no room at the inn”. This time we had taken no chances and had reserved ourselves a table, it was just as well we had, as on arrival the Auberge was well populated and by the time we had eaten our first course there were only a few odd places left. The service was relaxed, the maitre served us and he was dressed in jeans with a shiny silver grey shirt, unbelievably this was not the most spectacular thing about him which was in fact his magnificent handlebar moustache. I can imagine that if and when things got a little less hectic and he had more time to perform, he would be very amusing indeed. However today he was flat out and had very little time to engage anyone in anything other than orders and deliveries, which he performed with gusto and good humour singing and humming as he went. Trevor had a non alcoholic beer whereas I stuck to a glass of the vin de table, which was included with the meal, it was as usual not a grand vin but was nonetheless perfectly acceptable. We both went for the meal of the day which was a very acceptable 12 euros. The starter consisted of Pate, Macedonian vegetables (diced beans and carrots with peas) in mayonnaise wrapped in a slice of ham, with half a boiled egg and some cornichons (small gherkins). It was a very good mixture and the dish of pate (which was delicious) was left at the table so you really could eat as much as you wanted. The main course was a roasted chicken breast with a mushroom sauce served with boiled rice and garnished with lettuce and tomato. The tastes of all of this were fabulous, chicken in France seems to be inherently tastier than the chicken we buy in England, it was however a touch overcooked for me and therefore a bit drier than I would have preferred. The mushroom sauce was full of flavour and was very well balanced but it was a little sparse, but the rice was absolutely perfectly cooked, which might sound simple but it is remarkable how often restaurants get rice wrong, especially when the dish is, like this one, not a specific rice dish. The garnish a sprig of lettuce and a slice of tomato was more than a bit tired, I suppose you could say that it was meant to be more decorative than anything else, but I firmly believe that if you put something on the plate you should expect it to be eaten and as such you should give it as much care and attention as anything else that you plate up. All that having been said overall the main course was good enough. The cheese board though not having the widest choice was however left at the table so that you could help yourself to as much as you wanted. The dessert was a home made plum tart; it was as good as a plum tart can be with a light sweet pastry providing a perfect balance with the tartness of the plums. The maitre offered us a juice; we said we would prefer large white coffees which he brought without any fuss. This is a good restaurant and I would like to return to try one of the other more expensive menus, which were 29 and 35 euros and had such delicacies as frog’s legs on them. The menu that we ate was in general well cooked, very tasty and excellent value for money. The restaurant itself is attractive and the service is very good. It is easy to be picky, and I feel that that is my job but in truth for 12 euros a head, this is in my experience surpassed only by the Donjon at Bazoges, I would definitely recommend this restaurant, but book to avoid disappointment. 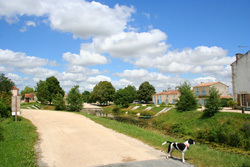 I would also recommend that you leave yourself a little extra time after lunch to have a gentle stroll around the port to allow your lunch to go down and to enjoy this beautiful peaceful place.